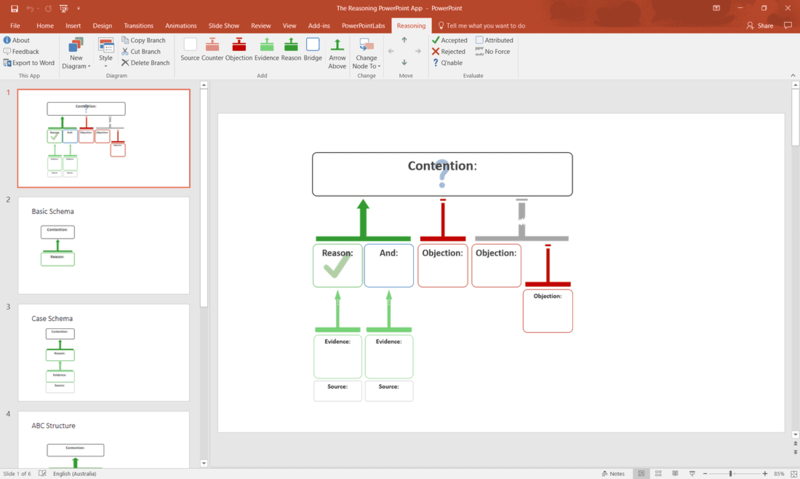 ​We've created an add-in for PowerPoint to support argument mapping. The​​ free email course ​Argument Mapping: Make your reasoning clear and compelling. A link to the app will be provided in your Welcome email. The online Argument Mapping Short Course. The Structure of Reasoning online course. Alternatively you can purchase the app here. ​The App requires PowerPoint 2010 or later for Windows. Unfortunately there will be no version for PowerPoint on a Mac. Microsoft has not made this possible.